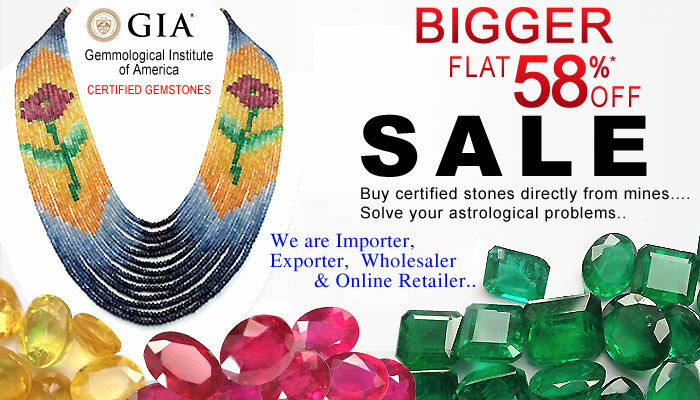 Please note that all Gemstones & Jewellery is sold "as is" and do not allow the Members to make any changes on them. Some items may appear slightly larger or smaller than actual size due to screen defaults and photography techniques. Sometimes the items may be represented larger than the actual size in order to clearly show details or smaller than the actual size in order to show the entire item. We offer FREE SHIPPING of all our products in all over World. Shipping time is 24 Hours form at the time of purchase. All items are fully insured. All Jewels & Jewellery items package from Jewelleryshopindia.com arrives at your doorstep in a strong, durable and tamper-proof IRON packing box. At a time of purchase auto-email communication sent to customers mail ID with full invoice and product details and in next 24-48hrs product will be couriered. Note : There can be delay caused by third party courier / postal services in product delivery and KGN International shall not be liable for this delays and discrepancies. Our 7 days No Questions asked Return Policy gives you time to make sure your purchase is perfect. If you need to return it for any reason, we will happily provide you with a 75% refund or 100% exchange, within 7 days of the purchasing date. Gemstones should only change hands when accompanied by a certificate attesting to quality. Regardless of location or marketplace, an authentic Laboratory Report is the common language of trust and confidence in the gemmological world, and it should be consider an essential part of any transaction. We take this responsibility very seriously. Our 7 days No Questions asked Return Policy gives you time to make sure your purchase is perfect. If you need to return it for any reason, we will happily provide you with an 75% full refund or 100% exchange. Note : upto 4000 rupees item(s), we will deduct 1000 rupees as shipping charges, insurance & lab certificate. Once the above are established www.jewelleryshopindia.com will credit user s payment account. We request for such returns within 7 days from delivery of the product to your shipping address. We shall process the refund subject to receipt of the merchandise by us in unused condition in its original packaging along with original tags and invoice, failing which return/ refund may not be possible. Before accepting delivery of the product/s, please ensure that the packaging HAS NOT BEEN DAMAGED OR TAMPERED with. If you believe that the merchandise is not in good condition, or if the packaging is tampered with or damaged, before accepting delivery of the goods, please refuse to take delivery of the package, and call our all-day helpdesk at +91-9166888883 (10:00 am to 8:00 pm) or e-mail us at support@jewelleryshopindia.com, mentioning your order reference number. We shall make our best efforts to ensure that a replacement delivery made to you at the earliest. In the event you return any item, which is delivered, to you in damaged/defective condition, there will be no additional shipping charges. After the merchandise is received by www.jewelleryshopindia.com, and subject to verification of the purchase and condition of products we shall process a refund within 15 business / working days of receipt of the product/s. Refunds of payments charged to the Cardholder's debit /credit card will only be credited back to the Cardholder's debit / credit card account, which was used to pay for the original order. Please note that we shall not be responsible for any delays in credit to the Cardholder's debit / credit card account as that will managed by the Cardholder's issuing bank. We shall not allow any exchange/return of products due to the price differential that exists, as no two similar products will be exactly of the same price. All items must be returned in their original condition as unworn, unaltered, and undamaged. Items returned without an attached brand/ security tag will be subject to 20% revaluation fee. Customized Jewellery which includes personalized products manufactured in line with specific instructions from buyer is not eligible for return/money back. Product should be accompanied with Original Product Certificate and Original/Copy of Invoice for all returns/exchange/money back within the 7 Days time. Submission of Invoice shall be optional for all Exchange/Money back after the 7 Days Exchange Period. For all Money Back transactions, Value Added Tax at the applicable rate shall be collected from the money back value. The prevailing rate is 1%. In case of Money back, the payment shall be made by way of an account payee cheque within 7 Days of receipt of product along with Certificate and Invoice subject to quality confirmation and acceptance. www.jewelleryshopindia.com reserves the right to change the exchange/money back price of the product based on the Quality Inspection. THIS AGREEMENT SHALL BE DEEMED TO BE MADE UNDER, AND IN ALL RESPECTS SHALL BE INTERPRETED, CONSTRUED AND GOVERNED BY AND IN ACCORDANCE WITH, THE COURTS OF JAIPUR, THE LAW OF THE STATE OF RAJASTHAN, INDIA, WITHOUT REGARD TO ANY CONFLICT OF LAW PRINCIPLES THAT WOULD CAUSE THE LAWS OF ANY OTHER JURISDICTION TO APPLY. Each party hereby irrevocably submits to the jurisdiction of the courts of Jaipur, State of Rajasthan and Country of India and hereby waive, and agree not to assert, as a defense in any such action, suit or proceeding for the interpretation or enforcement hereof, that it is not subject thereto or that such action, suit or proceeding may not be brought or is not maintainable in said courts or that the venue thereof may not be appropriate or that these Terms and Conditions or any such document may not be enforced in or by such courts, and the parties hereto irrevocably agree that all claims with respect to such action or proceeding shall be heard and determined in Jaipur Court. The parties hereby consent to and grant any such court jurisdiction over the person of such parties and over the such subject matter and agree that mailing of process or other papers in connection with any such action or proceeding in such other manner as may be permitted by law shall be valid and sufficient service thereof. The details of the products or product specifications (for instance weight, color, handwork details, size, etc.) quoted with the product displays are only fairly approximate values. While every endeavor has been made to accurately reproduce colors, there may be minor variations in color of the actual product because of the nature of product, weather at the time of differences in display output due to lighting and digital photography and color settings and capabilities of monitors. A customer must place an order keeping in mind this minor variation in color as seen on a computer screen against the actual color of the product received. Jewelleryshopindia.com believes that all online buyers are aware that colors seen on a monitor will be slightly different as compared to the actual product or accessories ordered. We wish to clarify and ascertain that every customer who orders any jewellery from www.Jewelleryshopindia.com is aware of this genuine problem.